This workshop is for anyone who wants to write a song that counts: for ourselves, for the people (or pets) we love, and for the world. Now in our seventh year, this is a new, exciting format for us and our growing songwriting community! There will be smaller-than-ever breakout groups of 6-8 focusing on vocals, guitar, and songs where everyone gets heard and also bonds with other songwriters. Dar will also offer each songwriter a one-on-one private song consultation. We will have optional day trips for inspiration in the local area – museums, hikes, and historical buildings; and our evenings will be filled with music sharing, so we all really get to know each other. Dar will be joined by a small support team of songwriters, a guitar and vocal coach, and a yoga teacher. As always, we will enjoy the many bounties the Garrison Institute offers, from its beautiful natural setting on the banks of the Hudson to its delicious vegetarian meals. Please note that as healing, life-affirming, and cathartic as songwriting can be, this is not designed as a therapeutic retreat. We welcome songwriters of all levels (over age 16) looking to court inspiration, connect with others, and refine their songwriting abilities so they can effectively express what they really want to say. 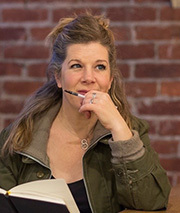 Dar Williams has been writing songs and touring for over twenty years, drawing inspiration from her travels over four continents and from the Hudson Valley where she lives. She has recorded nine studio albums (eight with Razor & Tie Records), clocked in almost 2,000 gigs, and has enjoyed teaching at the Rocky Mountain Folks Festival song school, Jorma Kaukonen’s Fur Peace Ranch, and in conjunction with concerts at many schools. Teaching an undergraduate course about music movements and democracy at Wesleyan University renewed Dar’s faith in the importance of making music and also in the intrinsic, life-affirming value of creating songs, a process she is excited to be sharing in her neck of the woods.